As autumn turns to winter, the Travel Market turns its focus to the ski season and winter breaks. The UK ski industry is worth over £3 billion pounds, but according to Statista the UK has seen a decrease in participation in recent years, with the number of monthly participants in snow sports falling from 186,500 in 2008 to 140,000 for the 2017/18 season. The Ski Club of Great Britain have stated existing skiers show an unwavering loyalty to the activity, with 97% of people who skied last season planning to do so again this season. The issue is attracting first time skiers to the market. How can you attract new skiers and gain customers for life? Create content for first timers! Booking your first ski can be a daunting task. Many ski sites will offer content for first time skiers, but not many do it well. Ski resorts most viewed content is aimed at first time visitors, great content to include is either a step by step highlighting transfers, accommodation, ski passes, lessons or what to expect guides. There are a lot of questions to be answered when booking a ski trip; answering them and filling in the gaps for a first time booker can make them feel assured, fulfilled, and more likely to book their trip. Imagery & video are such a big part of skiing. Snow-capped mountains under clear blue skies, (some) skiers gliding down the mountain effortlessly is a great visual to inspire bookings. You will find stunning imagery on all ski resort sites. Resorts rely heavily upon visuals to create stories, experiences and emotional connections, and video and imagery is easily the best way to do this. However don't forget about the first time bookers, seeing beautiful visuals is inspiring, with first timers hoping to reach that level, but they will be just as interested in understanding the basics, or being shown where the nursery slopes are, or even how to navigate chair lifts, or button lifts. There is nothing more demoralising than being dragged face first up the mountain on your first attempt on a button lift, believe me! 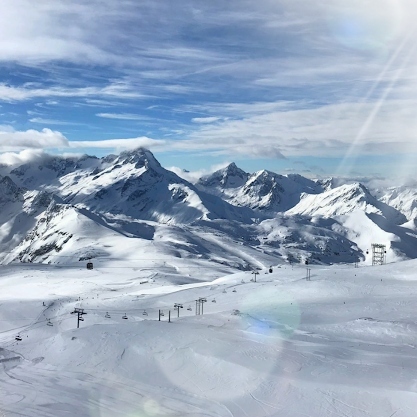 Europe continues to lead the way in the top 10 ski resorts lists for the 2018/19 season, with France dominating bookings for 2018/19 and 43% of bookings travelling to the French Alps compared to a 21% market share for the USA. La Plagne has seen a huge increase in popularity recently, and sits alongside Tignes and Val d’Isere as the three most popular French resorts. Ensuring you have great content for resorts like these can be a great way to drive bookings. According to The Chalet Company, the average cost of a seven day ski trip is approximately £1435 per person, which is higher than the industry average of £815 per person for a non-ski holiday. With the added cost, consumers want to thoroughly research where they’re going and what’s on offer. With so many variables/options when booking a ski trip, what are the other contributing factors that consumers look for when booking? Resort: The resort itself is the main contributing factor when it comes to ski booking, with consumers happy to pay more for the right resort. Price: As with all travel, price is a major factor when booking, and when it comes to skiing, there are a lot of costs to think about for flights, accommodation, ski passes, ski hire and transfers. Location: Does the location suit their needs? Is it family friendly? Does it have the right slopes for their ability level? And how long will it take to get there from the airport? These are all questions consumers take into consideration when booking. Accommodation: Types of accommodation play a role in bookings, with the choice of hotels, hostels, chalets, catered or non-catered. Chalets are the most popular accommodation, with 76% of travellers preferring that option. Flights: Departure and arrival airports can be a deciding factor, but play less of a role than the resort itself; travel links are so good nowadays you shouldn’t have to travel too far to an airport to go to your desired resort. Transfers: Just how long you will be sat on that transfer after a long journey can tip consumers towards certain resorts. Facilities: Does the resort have all the facilities they are going to require? Does it have a ski school, childcare options, après ski or a folie douce? Weather: Ok, not something you can control, but travellers will be checking weather reports daily sometimes hourly in the lead up to a trip, and play a huge factor in the success of a ski season. According to Consensio 77% of travellers said last season’s snowfall had an impact on booking again this year. By supplying answers to the above questions in your content, you can alleviate doubt from first time skier’s minds, and help drive bookings. As research has shown, if you can get a first time skier to convert and book, you may have gained a customer for life. You can contact our team to find out more about how to take your travel marketing to new heights.